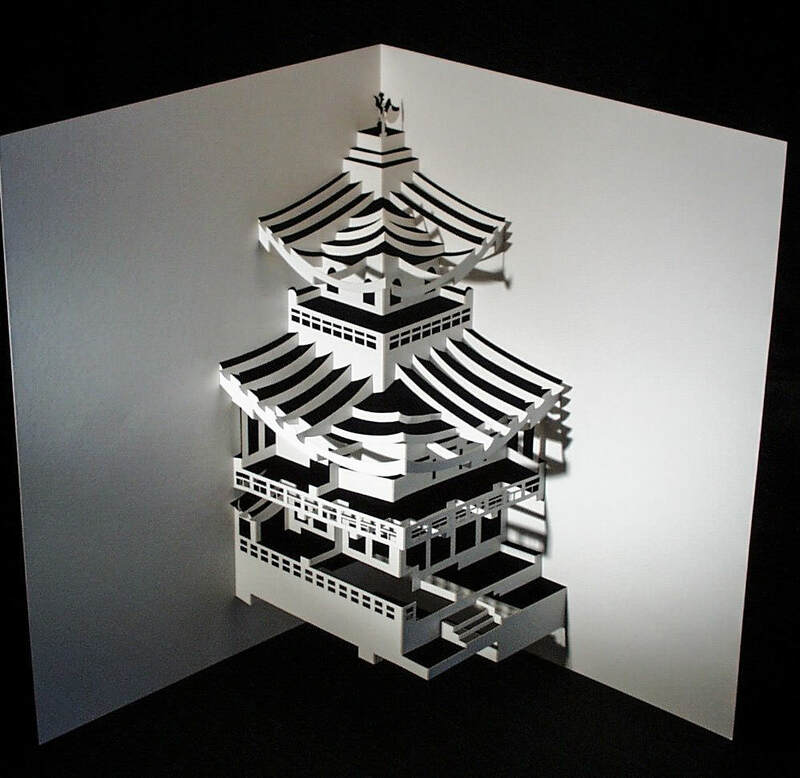 Another paper masterpiece from origamic architecture artist Ingrid Siliakus. This beautiful Japanese Pavilion is beautifully laser-cut and hand-scored, folded, and assembled. Each piece is mounted onto an integrated backing card. Folded flat, they measure 15 by 21 centimeters. Signed by the artist, Ingrid Siliakus. Located in Kyoto, Japan, the Temple of the Golden Pavilion (Kinkaku-ji) is also known as the Deer Park Temple (Rokuon-ji). Shogun Ashikaga Yoshimitsu started building it in 1397 as part of his retirement estate. After his death, the villa and gardens became a Zen Buddhist temple complex and home to a number of sacred relics of the Buddha. Fire has claimed the temple several times, most recently in 1950. The current structure was built in 1955. Each of the temple’s three floors is designed in a different style. The first floor, known as Hosui-in (Chamber of Dharma Waters), is of the shinden-zukuri style, characteristic of tenth century Japanese palaces. It includes a courtyard, pond, veranda and, a large room for greeting guests. The second floor is in the buke-zukuri style of traditional Samurai homes, characterized by compactness and asymmetry. This level features the Cho-on-do or Hall of Roaring Waves. The top floor, known as Kukkyo-cho (Firmament Top) is covered in gold leaf and built in the karayo (Zen temple) style. Characterized by simplicity, it is intended to invoke feelings of tranquility. The floor space on this level is a mere seven square meters (23 square feet). It is used primarily for tea ceremonies and small intimate meetings. The roof is made from thin sheets of Japanese cypress and, is topped with a gilded phoenix. Overall, the structure reaches a height of 12.8 meters (42 feet).